The capital city of Odessa oblast. Related articles: Odessa resorts and beaches. Odessa or Odesa is the third largest city in Ukraine located in the south of the country, the administrative center of the Odessa region and the main naval base of the Ukrainian Navy. This city, standing on the shore of the Odessa Gulf of the Black Sea, is the largest commercial sea port of Ukraine. The population of Odessa is about 1,010,000 (2016), the area - 237 sq. km. The phone code - +380 48(2), the postal codes - 65000-65480. Local time in Odessa city is April 21, 5:33 pm (+2 UTC). 13 May, 2018 / Walking around Odessa in May. 18 September, 2016 / Odessa - the view from above. People began to live in the territory of present Odessa at least since the era of the Upper Paleolithic (about 50 thousand years ago). In the 6th-2nd centuries BC, the ancient Greeks founded twelve colonies here. In the second half of the 4th century AD, this territory was occupied by the Huns during the Migration Period and the colonies fell into decay. At the end of the 14th century, on the site of the former Greek colony, a Genoese trading post of Ginestra appeared, which traded with nomads. At the end of the 15th century, the Lithuanian-Polish authorities on these lands weakened. In 1484, these lands passed under the control of the Crimean Tatars. By the beginning of the 17th century, Rzeczpospolita lost control of the Black Sea coast in favor of the Ottoman Empire. At the beginning of the 18th century, it was a small trading town of the Ottoman Empire called Kachibey or Hajibey. In 1765, the Ottoman authorities rebuilt the old Lithuanian fortress in connection with the increasing pressure on this region by the Russian Empire. In 1774, the fortress was first captured by the joint Cossack-Russian troops. However, according to the Treaty of Kuchuk-Kaynarca, it was returned to the Ottomans. During the Russian-Turkish War of 1787-1792, the fortress was again captured by Russian troops. The population of the town was several hundred people, mostly Ottomans and Tatars. In 1794, Empress Catherine II issued a rescript about the founding of the town and harbor on the site of Kachibey. This year is considered the beginning of the official history of present Odessa. 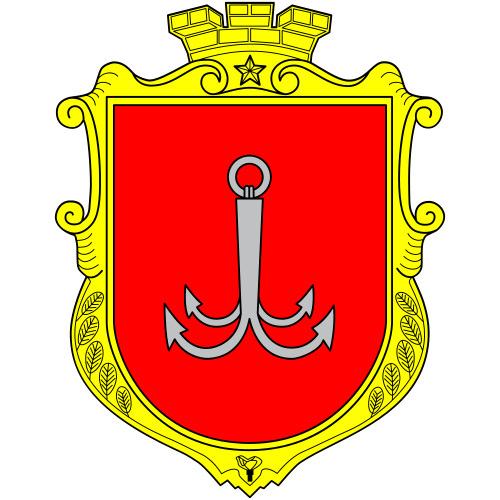 Odessa, the new name of the town, was first mentioned in 1795. The population of Odessa began to grow rapidly. In 1799, it was about 4,200 people, in 1803 - 9,000, in 1812 - 20,000. The town became the main port through which grain was supplied from the Russian Empire to other countries of Europe and Asia. Odessa became known in the world as a gate to the Russian Empire. Emperor Alexander I decided that the newly conquered lands in the south needed a progressive administrator. In 1803, the Duke de Richelieu, a descendant of the famous Cardinal Richelieu, became the first mayor of Odessa. He created favorable conditions for the development of trade. For a decade under his administration Odessa received a lot of new streets and buildings. In 1812-1813, there was an epidemic of plague in Odessa. As a result, about 10% of the population died. The dead were taken to a huge common grave outside the town, a hill that arose on the burial site received the name Chumka (“chuma” means “plague” in Russian). Today, this hill is located almost in the center of Odessa. In 1815, Richelieu, after receiving an invitation to head the French government, left the Russian Empire. In memory of this town governor, who played a big role in the formation of the Odessa, one of the main and most beautiful streets of the city was named Rishelievska. By the middle of the 19th century, the population of Odessa was about 90,000 people. It became the second largest port of the Russian Empire after St. Petersburg. In April 1854, during the Crimean War, Odessa was bombarded by the British-French fleet, but without much success. After the war, Odessa continued to grow rapidly, especially after the construction of the railway in 1866. In 1873, the population of the city was about 193,000 people. In the same year, a water pipeline was opened. At that time it was the most modern water supply system in Europe and the largest in the Russian Empire. In 1897, there were about 403,000 people in Odessa (Russians - 49%, Jews - 31%, Ukrainians - 9%, Poles - 4%, Germans - 2.5%, Greeks - 1%). In 1902, the second funicular in the Russian Empire was opened. In 1903, with the help of Count M. M. Tolstoy, an ambulance station was opened. In the beginning of the 20th century, Odessa was the fourth largest city in the Russian Empire in terms of population after Warsaw, Moscow, and St. Petersburg. In 1905, one of the greatest tragedies in its history occurred in the city, namely the Russian Revolution of 1905-1907. In the summer of 1905, one of the most famous events of that revolution happened here. The sailors of the battleship “Prince Potemkin-Taurian” raised an uprising, which was the first military mutiny during the revolution. Upon the arrival of the battleship in the port of Odessa, a crowd of sailors and locals began to loot and burn the warehouses. These events and their armed suppression caused great casualties among civilians, about 500-1,000 people were killed. Sergey Eisenstein’s classic movie “Battleship Potemkin” is based on these events. It was filmed in Odessa in 1925. During the same revolution in Odessa, as in many other cities of the Russian Empire, there was a wave of anti-Jewish pogroms. In Odessa, about 400 Jews were killed during the pogroms in 1905. In 1910, the pilots Mikhail Efimov and Sergei Utochkin conducted the first flights on airplanes in the Russian Empire at the Odessa Hippodrome. In the same year, the first electric tram was launched. In 1913, a new educational institution was opened - the Odessa Conservatory. During the First World War, Odessa was attacked from the sea. In October 1914, the Turkish fleet shelled the city and port. The revolutionary events of 1917 brought chaos. The city experienced devastation and frequent change of authorities. A lot of residents of Odessa had to leave it. During the Second World War, the defense of Odessa lasted 73 days. October 16, 1941, Odessa was captured by the Romanian-German troops. Almost three years Odessa was part of the Romanian Kingdom. April 10, 1944, the city was liberated by the Soviet army. By 1948, all important port and industrial facilities were rebuilt. Despite the fact that industry and construction in Odessa actively developed, the city lost its importance as one of the most important cities in the country and received the unofficial status of a provincial city. 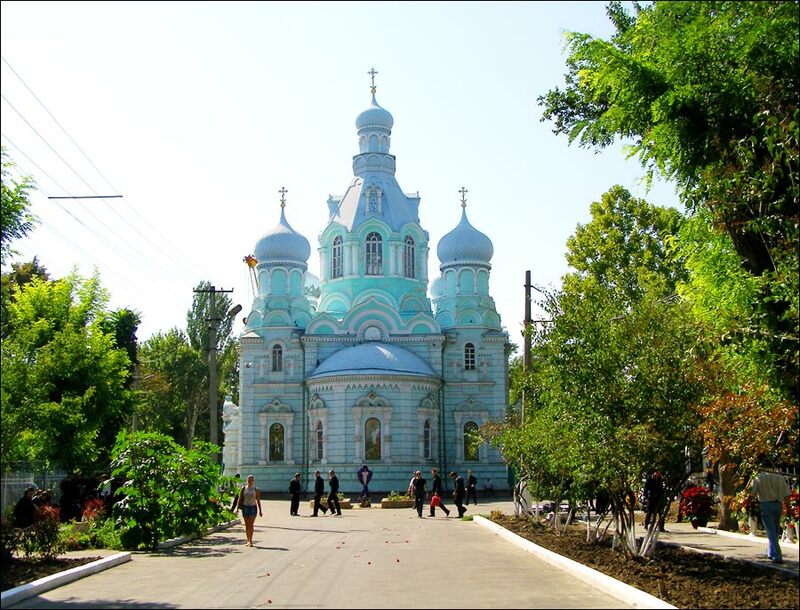 The historical center was almost not restored, which led to the decline of many architectural monuments, cemeteries and churches were destroyed. Since 1991, after Ukraine proclaimed independence, a lot of industrial enterprises in Odessa were closed due to the severance of economic ties with the former republics of the USSR, insufficient support from the authorities, and inability to work in the new economic conditions. Since the late 1990s, Odessa has suffered significant losses because of the construction of modern residential buildings and business centers in the historical center. A lot of buildings that have historical and cultural significance are gradually declining. There are several versions about the origin of the name of Odessa, but the most reliable one is the assumption that the town was named in honor of the ancient Greek colony of Odessos. Originally, it was assumed that the ancient Odessos existed near the Odessa Gulf. Later, archaeologists found the remains of this colony near the Bulgarian town of Varna located on the Black Sea coast about 400 km to the south-west of Odessa. 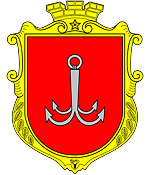 At the end of the 18th century, in the Russian Empire, there was a tradition of naming new towns, located in the northern Black Sea region just captured from the Ottoman Empire, similar to the names of the ancient Greek colonies, which once existed there. Odessa also has a number of unofficial popular names: Odessa-Mother, Pearl of the Black Sea, Pearl near the sea, South Palmira, South Capital. Odessa is located on the shore of the Odessa Gulf on the northwest coast of the Black Sea, at a distance of about 39 kilometers from the border with Moldova. The total length of the coastline of Odessa is about 30 km. Like any seaside city, Odessa is famous for its beaches, there are a lot of them, and the coastline from Lanzheron to the Great Fountain is, in fact, one continuous city beach. The climate of Odessa is temperate-marine with subtropical features: mild winter; relatively long spring; warm, long, often very hot summer; long and warm autumn. The average temperature in January is minus 0.5 degrees Celsius, in July - plus 22.6 degrees Celsius. The local climate is characterized by a large number of sunny days (250-300). Odessa is the largest seaport of Ukraine transporting grain, sugar, coal, oil products, cement, metals, jute, timber, products of the machine-building industry. The city is also a major railway center. The main industries are oil processing, engineering, metalworking, light, food, woodworking, agricultural, and chemical industries. The resort area of Odessa stretches for tens of kilometers along the Black Sea coast. One of the most popular resort and entertainment districts of Odessa is Arcadia. On its territory there are sanatoriums, rest houses, as well as a hydropathic institution, a resort polyclinic, a tourist base, hotels, numerous restaurants and nightclubs, other entertainment facilities. In Odessa and near it, as well as to the west of the Dniester along the Black Sea coast, there is a group of balneo-mud, balneo-climatic, and climatic seaside resorts. Odessa International Airport connects Odessa with Vienna, Tel Aviv, Sharm El Sheikh, Istanbul, Ankara, Warsaw, Dubai, Prague, Kyiv. Passenger trains run regularly between Odessa and Warsaw, Prague, Bratislava, Vienna, Berlin, Moscow, St. Petersburg, the main cities of Ukraine, and a lot of other cities of the former USSR. The architecture of Odessa is represented mainly by buildings constructed in the styles of neoclassicism, modernism, postmodernism, constructivism in the 19th-20th centuries. 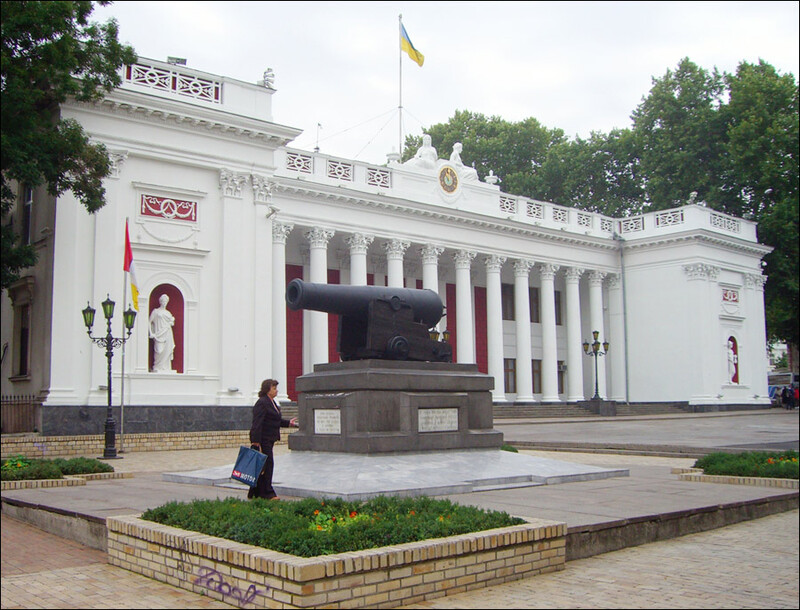 The historical center of Odessa is listed in the preliminary UNESCO World Heritage List. Odessa is famous for its picturesque streets and yards. In the city there are a lot of monuments, including very unusual ones. 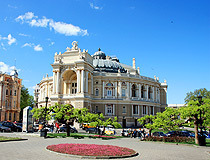 Odessa is one of the most important cultural centers of Ukraine. There are a lot of theaters and museums that have a long history. Many cultural figures were born and grew in this city: pianists Emil Gilels and Svyatoslav Richter, violinist David Oistrakh, singers Leonid Utesov and Valery Obodzinsky, composer Oskar Feltsman, actors, writers, artists. In Soviet times, Odessa became known as the capital of humor. Isaac Babel, Ilya Ilf and Yevgeny Petrov, Mikhail Zhvanetsky, Roman Kartsev were born in Odessa. April 1 is celebrated as the Day of Humor - there is a parade of humor, artists and clowns perform on the streets. The City Day of Odessa is celebrated on September 2. September 2, 1794, after the prayer and consecration of construction sites, the first piles were built in the foundation of the town. Celebrations usually last for several days, the main events take place on the first weekend of September. Derybasivska Street. This famous pedestrian street, glorified by poets and writers, is located in the center of Odessa. Named after the first Odessa mayor I. Deribas, it is built up by low-rise buildings of the 19th century, the ground floors of which are occupied by numerous shops, restaurants, and cafes. Traditionally, Derybasivska hosts major city events, in particular the Humor Parade during the annual Day of Humor celebrated on April 1. It is a popular place for walking. You can buy paintings made by local artists and a variety of souvenirs here. Prymorskyi (Seaside) Boulevard - one of the most beautiful streets in Odessa, a favorite place for walks of locals and tourists. The boulevard runs parallel to the seashore. The main attraction of Prymorskyi Boulevard is Potemkin Stairs (1841) counting 192 steps, descending to Odessa Marine Passenger Terminal. There is a funicular operating nearby. Opera House (1887). 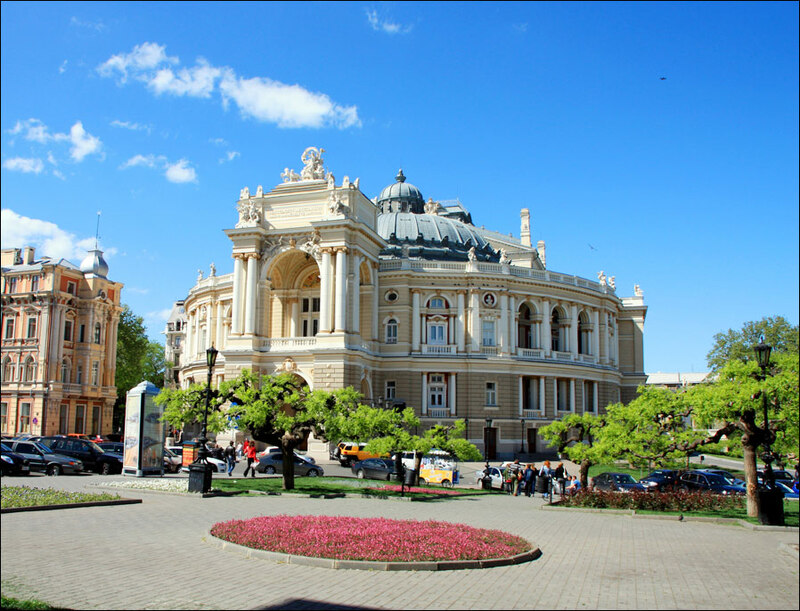 The richly decorated building of Odessa National Academic Theater of Opera and Ballet, constructed in the Renaissance style with baroque elements, is considered one of the most beautiful in the world. There is a museum of the Opera House, excursions are available. Chaikovs’koho Lane, 1. 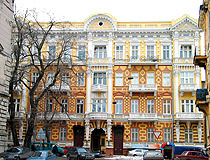 Londonskaya Hotel (1826-1846). A. Kuprin, A. Chekhov, T. Dreiser, V. Mayakovsky, L. Utyosov, and a lot of other celebrities of the 19th and 20th centuries stayed in this legendary hotel built in the style of the early Italian renaissance. Prymorskyi Boulevard, 11. Passage Hotel (1898) - one of the most beautiful buildings in Odessa surprising with its exquisite architecture and sculptural compositions. Preobrazhens’ka Street, 34. Faltz-Fein House (House with the Atlanteans) (1899-1901). 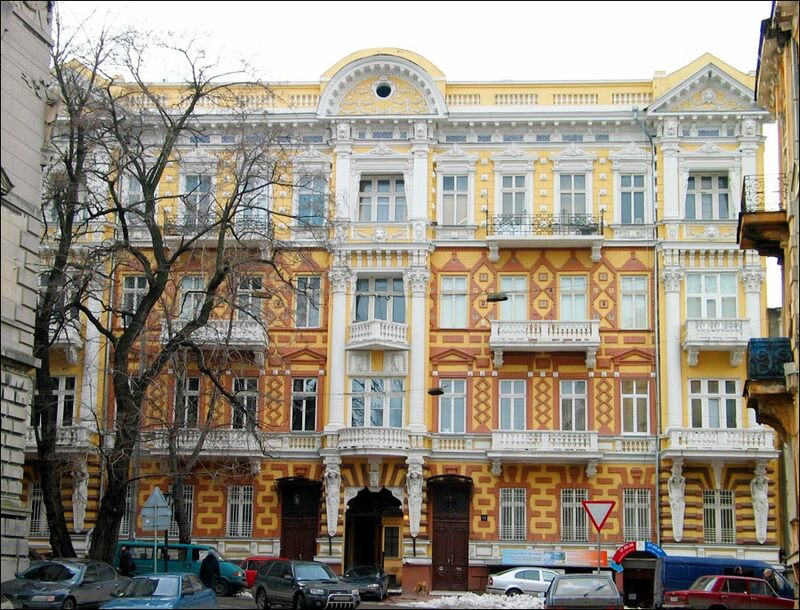 It is considered one of the most beautiful residential buildings not only in Odessa, but also in Ukraine. The figures of mighty Atlanteans, bent under the weight of the starry globe, became one of the symbols of Odessa. Hoholia Street, 5-7. Vorontsov Palace (1824-1827) - the former palace of Governor-General of the Novorossiysk Territory M. Vorontsov. 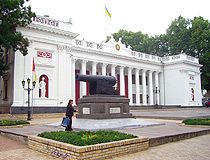 The colonnade of the belvedere on the embankment is considered one of the symbols of Odessa. Vorontsovs’kyi Lane, 2D. Witch (Flat) House. This old house, built in the 19th century, attracts tourists with a unique architectural feature. When you look at it from a certain angle, a complete illusion is created that the building has only one wall - a facade one. Vorontsovs’kyi Lane, 4. St. Panteleimon Monastery (1896). 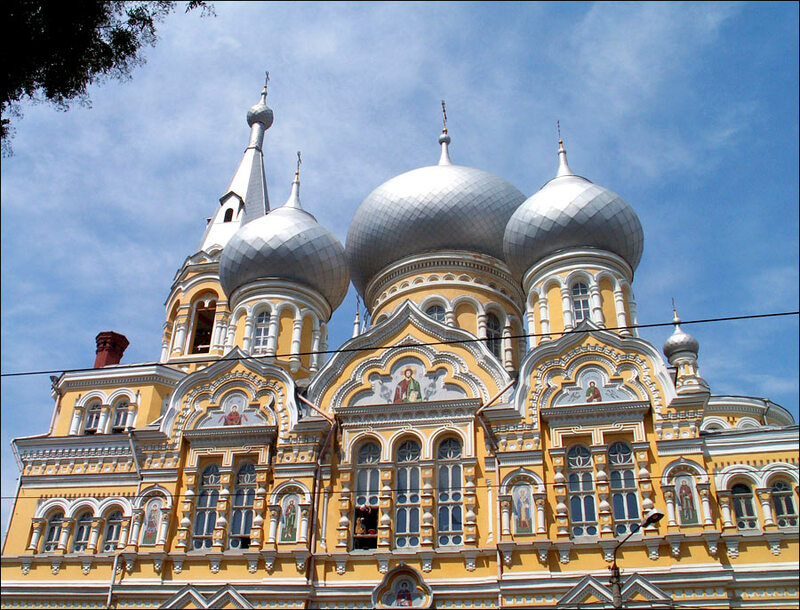 Founded by Greek monks from Athos, the monastery hosted pilgrims departing from Odessa to worship in holy places. 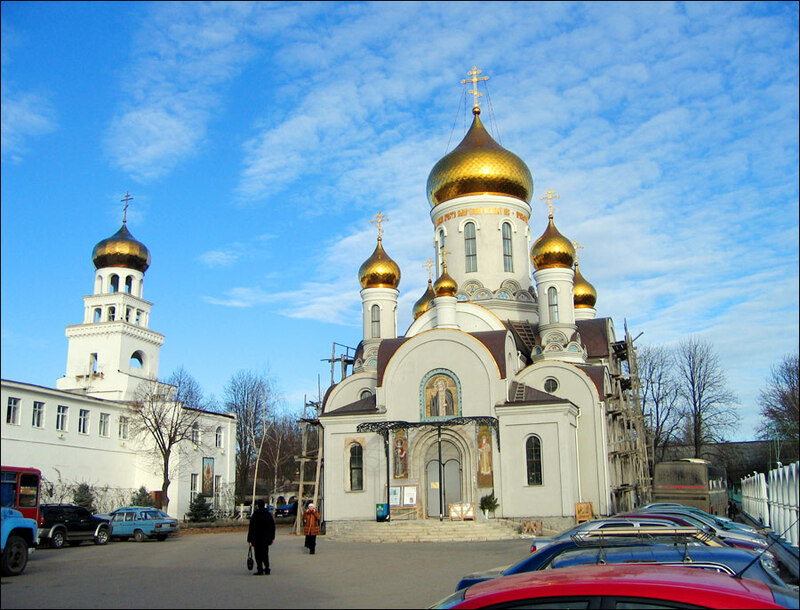 Five domes of the monastery, unusual mosaic on the walls reflect a mixture of different architectural styles of the 19th century. Panteleimonivs’ka Street, 66. Cathedral of the Assumption of the Blessed Virgin Mary (1848-1853) - the main Roman Catholic church in Odessa. In 1935, the church was closed. 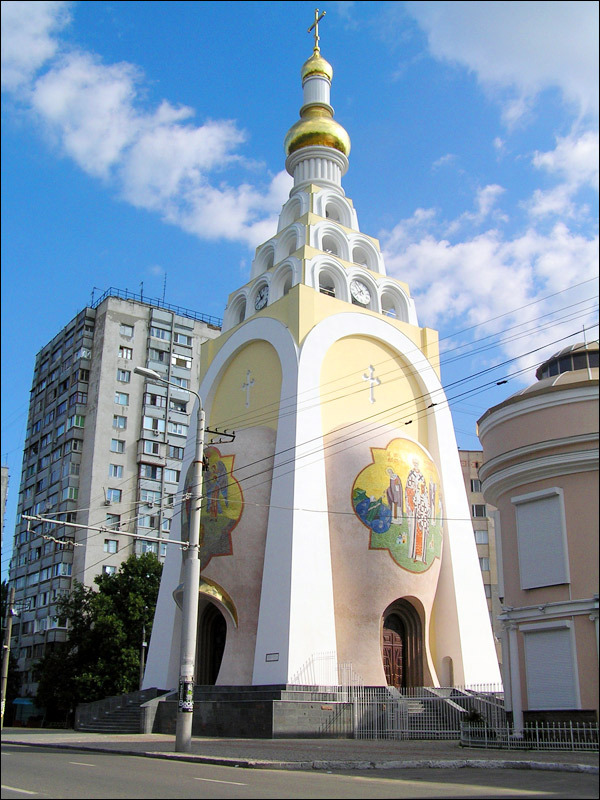 In 1991, it was returned to the Catholic community of the city. Katerynyns’ka Street, 33. 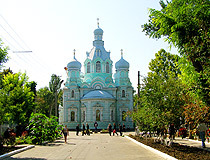 Holy Trinity Cathedral (1804-1808) - the oldest church in Odessa. Katerynyns’ka Street, 55A. St. Paul’s Lutheran Church (1825-1827) - the main Protestant church in Odessa. 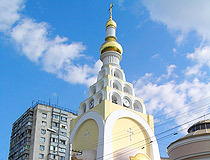 The 50-meter high bell tower of the church for a long time was the highest construction of Odessa. Novosel’s’koho Street, 68. Transfiguration Cathedral (1809-2002) - the main Orthodox church of Odessa. It was rebuilt from scratch in 2002, after it had been blown up by the decision of the Soviet authorities in 1936. Soborna Square, 3. Odessa Archaeological Museum (1825) - one of the first museums in Ukraine. In total, there are more than 150 thousand exhibits: monuments of history and culture of the Northern Black Sea coast, Ancient Greece and Rome, the best in Ukraine collection of Egyptian antiquities. The “Golden Treasury” exhibits authentic items made of precious metals. Lanzheronivs’ka Street, 4. Opening hours: 10:00-17:00. Day off: Monday. Odessa Fine Arts Museum (the Potocki Palace) (1805-1810) - a classical noble manor built for Countess O. Naryshkina, the youngest daughter of Stanislav and Sofia Potocki. The exposition presents paintings made by Ukrainian and Russian artists of the 16th-19th centuries: V. Tropinin, I. Aivazovsky, A. Savrasov, I. Shishkin, I. Repin, V. Surikov, V. Serov, M. Vrubel, N. Roerich, A. Benois, V. Kandinsky, and others. Sofiivs’ka Street, 5A. Opening hours: 10:00-17:00. Day off: Tuesday. Odessa Museum of Western and Eastern Art (1858). The exhibition includes paintings made by Dutch masters, porcelain from the best European factories of the 18th-20th centuries, sculptures and ceramics of Iran, Tibet, China, India, and Japan. Pushkins’ka Street, 9. Opening hours: 10:00-17:00. Day off: Wednesday. 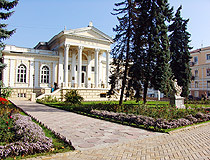 Historical Museum of Odessa. The museum presents documents, objects of applied and fine arts, numismatic collections, weapons of the 17th-19th centuries. The interior courtyard with a miniature park and an elegant fountain “Grotto” is of particular interest. Havanna Street, 4. Opening hours: 10:00-17:00. Day off: Friday. Museum of Contraband. The first museum of smuggling in Ukraine, it is located in the basement of an old house. There are more than 150 items of confiscated contraband and illustrations of the ways of their illegal importation. Also, visitors are introduced to how smugglers used the Odessa catacombs. Katerynyns’ka Street, 6. Opening hours: 11:00-21:00. Catacombs of Odessa. This museum-reserve includes ancient stone quarries for the extraction of building stone, military bunkers, and bomb shelters, as well as natural caves. The total length of underground passages of the museum is about 10 km. Balkivs’ka Street, 161. Museum of Sound - an exclusive collection of historical rarities of sound technology, audio equipment. The exposition includes gramophones, radios and tape recorders, vinyl records, audio cassettes, CD-disks, posters. Zhukovs’koho Street, 13. Opening hours: 12:00-18:00. Museum of Odessa Modern Art. The halls of the nonconformist art of the 1960s-1970s and the “New South Russian wave” of the 1980s-1990s are of particular interest. A separate hall is dedicated to the legendary “fence” exhibition of V. Khrushch and S. Sychev in 1967, which became the first Soviet unauthorized artistic action. Frantsuz’ky Boulevard, 8. Opening hours: 12:00-18:00. Al Salam Mosque - a large Moorish-style building of the Arab Cultural Center constructed in 2001. 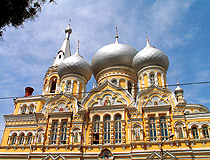 The mosque stands out prominently in the urban development and is a true eastern pearl of Odessa. 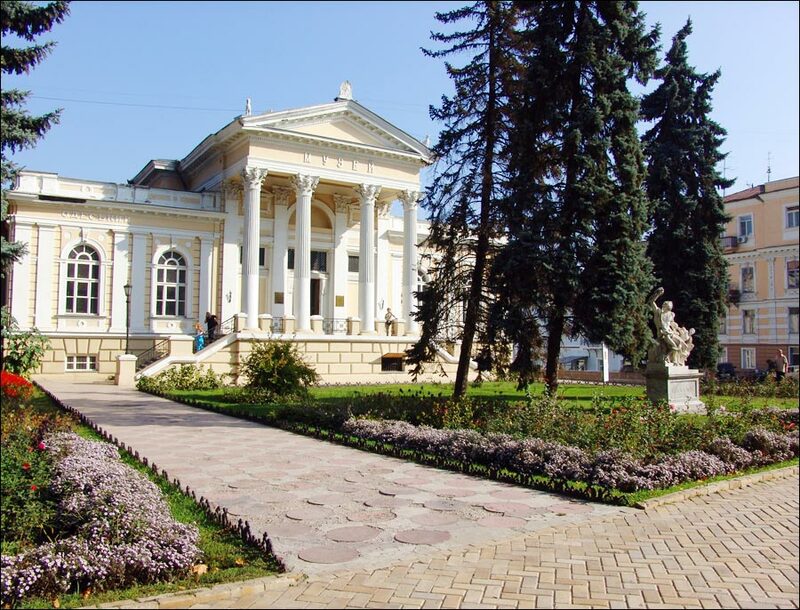 The Arab Cultural Center in Odessa is open for excursions, acquainting visitors with Arab culture. Rishelievska Street, 49. Opening hours: 11:00-17:00 except Friday. 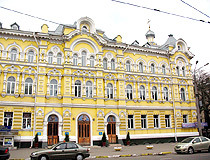 Odessa Philharmonic Theater (1899) - a building in the style of Italian Gothic with elements of the Renaissance that was originally built as the New Merchant Exchange. In 1949, it was rebuilt for a philharmonic society, however, according to Odessites, the acoustics in the building are still not very good. Bunina Street, 15. Ukrainian Music and Drama Theater (1903). 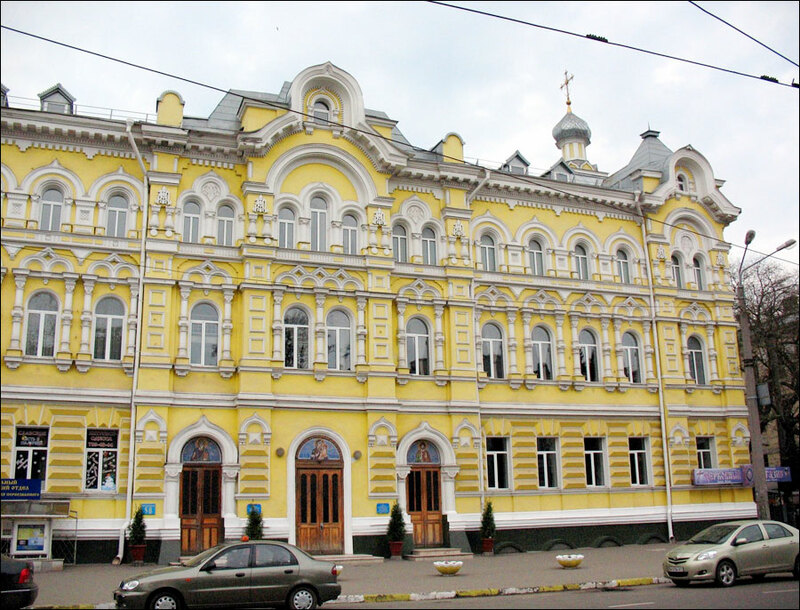 Odessa Academic Ukrainian Music and Drama Theatre named after V. Vasylko was named in honor of the outstanding Ukrainian theatrical figure V. Vasylko, who for many years headed the theater. Pastera Street, 15. Entertainment Center “Nemo” - a cultural and recreational complex with a dolphinarium, an oceanarium, and a hotel located in the center of the city. Lanzheron Beach, 25. Opening hours: 10:00-19:00, shows: 12:00, 15:00, 18:00. Odessa Factory of Sparkling Wines (1896). During the excursion, visitors are introduced to the whole technological process. After the tour, you can taste sparkling wines. Frantsuz’ky Boulevard, 36. Flea Market “Starokonka” - an interesting place for those who want to find cheap and useful things, collectors, and lovers of interesting souvenirs. It is better to come here early in the morning. Several blocks in the area of Rozkydailivs’ka Street and Starokinnyi Lane. Margie asks: Hello, Ukraine expert! 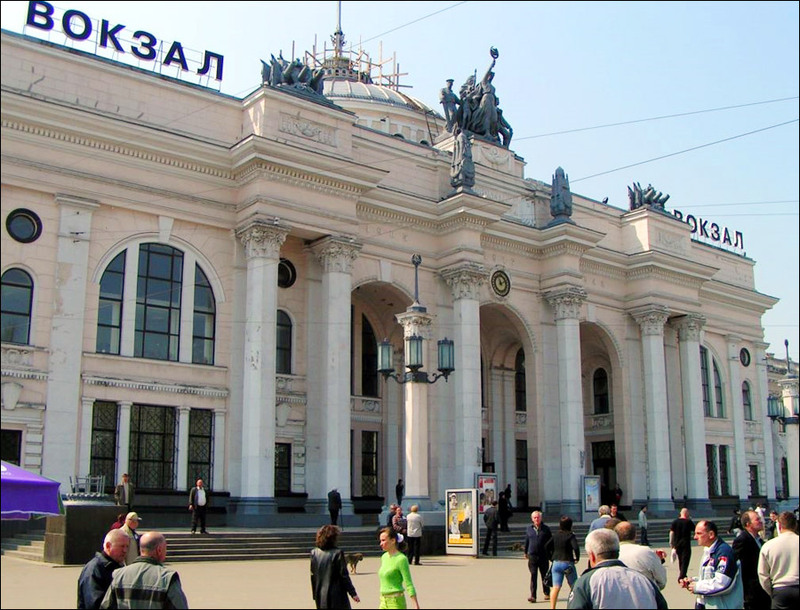 What do you think is the average taxi fare from the Odessa train station to the centre? Is it generally better to find a taxi at the train station, or to arrange a transfer from the hotel? Thank you. 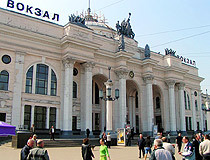 The average taxi fare from the railway station of Odessa to the city center is about 40-50 Ukrainian Hryvnias (2 USD). I think it would be better to arrange the transfer from the hotel. It will be more reliable and most probably cheaper. The official price of an international passport in Ukraine is in the range of about 20-40 USD, the time required to get it varies (from seven (urgent) to twenty days). As we receive a lot of similar requests, our advice is not to send any help to a person in Ukraine before you are absolutely sure that this person is real. Otherwise you are doing it on your risk. I have visited Odessa 3 times and I truly love this city and have found the people there to be very friendly. I have stayed in a few hotels and I loved staying at the Mozart hotel next to the Opera theater. One My last 2 stays in Odessa I have rented 2 different apartments and I loved both places. I will soon be returning to Odessa as It is My favorite place. I intend visiting Odessa next year and from what I have seen and read on the Internet it seems a beautiful city. I look forward to visiting it and meeting friendly people. I visited Odessa in 2013. I loved the city and country. Planing another trip! Would love to retire there.